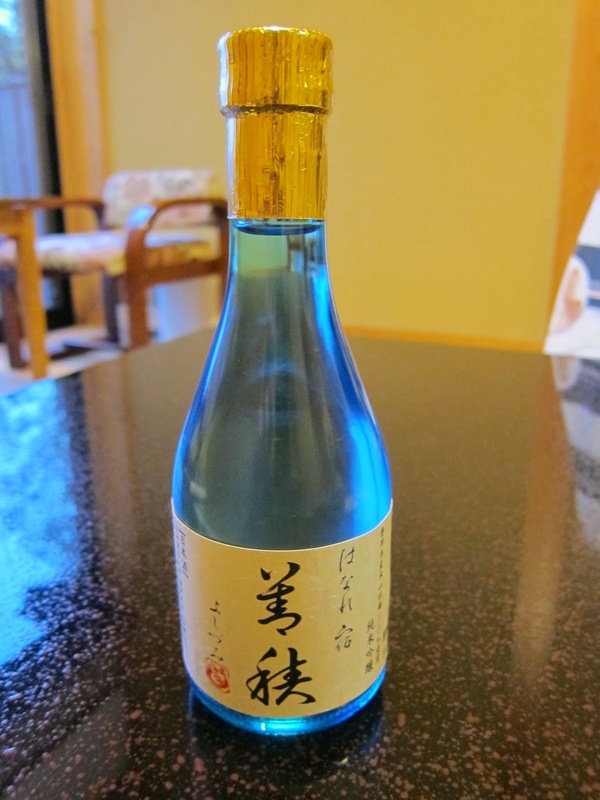 Sake could be nearly as complicated to choose from a list as wine. But in Japan, it's easier to order than beer. Most restaurants, even fine ones, have only a few sakes on the list. We stayed in a terrific gourmet ryokan in Izu-kogen that had only four sakes, and one was sold out. You could choose Yoshizumi (the local small-production sake they recommended), a cheaper alternative, or an expensive famous label (Kubota Manju, which is a heck of a sake.) We chose the local brew, which is of course what they want; the idea is that it goes with the local ingredients. One Tokyo restaurant we went to, Teppen, specializes in sake, and it had three pages of sakes -- but two pages listed 3 sakes each with extensive descriptions (including a photo of the brewmaster and a description of his philosophy), and one listed 9 with shorter descriptions. All told, it had 15 sakes from different regions, at different price levels. While not the longest list in Japan, it's more extensive than at 99% of other restaurants. California restaurants have been taking culinary cues from Japan for years, in ingredients, technique, and even actual dishes. Twenty years ago it was sushi; now there's a ramen craze. I wonder if there's something U.S. restaurants can learn for their wine lists from Japan's sake choice philosophy. Four options is too few, absolutely. But 15 sakes was plenty for one meal. If I ate at a restaurant more than once, I'd want a few more sake choices. I'd like to see them rotate in seasonal releases. And I'd like a couple of sakes-of-the-month. But unlike Wine Spectator, which rewards volume over precision in its wine list awards, I've always preferred a short, well-chosen wine list. The sommelier's job is important, but in this case the most crucial work happens before the restaurant opens, both in curating the selections and in writing descriptions that allow us to learn about our choices without having to ask about every wine on the list. Ordering is faster and less fraught with potential regret, and diners can concentrate on the reason they came: the food. 15 wines might not seem like quite enough for a fine restaurant; you need red, white, pink and sparkling. But really -- and consider that this comes from someone who enjoys Turkish Narince and Croatian Teran -- how many wine choices does anyone really need for one dinner? Well put. I definitely would prefer a place with a shorter wine list, but overall better quality wines. And I definitely like the idea of having actual descriptions of the wines. I would prefer a list longer than 15 but there is no need for an encyclopedic list at most places. A couple of well-chosen choices with both varietal and stylistic choices across several varieties and then a handful of lesser known discoveries tossed in ought to be enough for most restaurants. Thirty wines would be close to enough. I was going to say "no descriptions" because I don't want choosing a wine to be an exercise in speed reading, but I often take my cues from my neighbors, especially the wine drinkers. They do want to know what some of the names mean stylistically because they have a pretty good idea what they like for various foods, but far less idea how a Hallberg Pinot differs from a Dehlinger Pinot differs from a Sandhi Pinot, etc. So, a little help makes a lot of sense. I like shorter wine lists. The really long ones just have too many wines of the same types. Sebo in SF (closed) is an example. Six sakes and that was it. No sparkling wine. No white, rose or red wine. Ah, here's a restaurant wine list that is so far over-the-top it defies belief. 15 Martinelli Pinot Noirs by the half-bottle, for example. 212 pages of reading; skip your meal to read it but, unlike the Berns list, it's not fascinating. Excellent points. Most restaurants would benefit from smaller wine lists. I bet the lists of whiskies were quite extensive at those restaurants... but that's a different story altogether!